Samsung today launched two smartphones in its Galaxy A series today: Galaxy A80 and Galaxy A70. With this, the South Korean technology is keeping its promise to launch a Galaxy A series smartphone every month. Samsung has packed both the smartphones with impressive specifications. 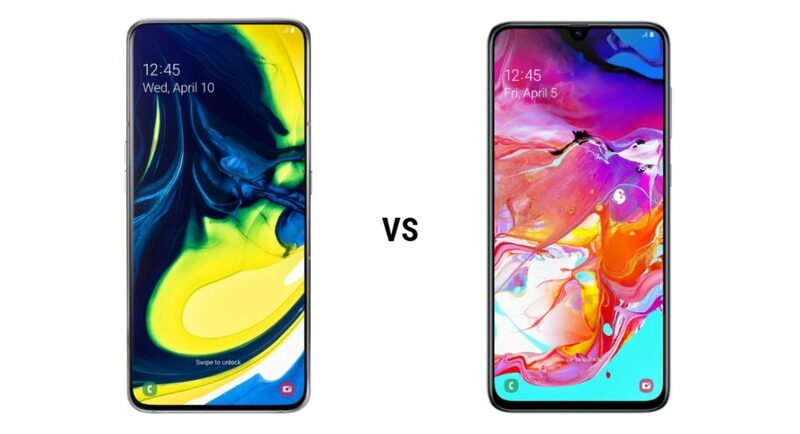 For instance, Samsung Galaxy A80 comes with a rotating camera and will let users take selfies from the triple cameras placed at the back panel. On the other hand, Samsung Galaxy A70 will have a massive 4,500mAh battery and comes with a 32MP selfie camera. While both the smartphones by Samsung have a different set of specifications, they are both aimed at millennials. So, if you have been waiting to upgrade your smartphone and would want to pick up one among the two from Samsung, we have made the task simpler for you. Samsung Galaxy A80: 48MP primary sensor, an 8MP ultra-wide sensor and a 3D depth sensor. Samsung Galaxy A70: 32MP main camera, an 8MP ultra-wide sensor, and a 5MP depth sensor. Samsung Galaxy A70: 32MP selfie camera as well with an f/2.0 aperture. Samsung Galaxy A70: Yes, up to 512GB.